REGISTER BY OCTOBER 1ST TO SAVE! Our 7th Annual Palliative Care Symposium kicks off with a keynote from Dr. Debbie Parker-Oliver, Realigning Cancer Care to Address Interactional Suffering. Friday afternoon, Dr. Kavita Patel of the Brookings Institution presents Health Care Reform: Back to Basics, followed by our annual poster session with a record 54 posters in addition to the three podium presenters! We are honored to welcome back AMA President, Dr. Barbara McAneny to present the Steven M. Grunberg Memorial Keynote during the Friday evening dinner. Saturday, we close out an incredible day of content with Dr. Darshan Mehta of the Benson-Henry Institute for Mind Body Medicine addressing the crucial topic of Career Burn Out and Self Preservation Strategies. Take a look at the amazing agenda - you won't want to miss this year's Annual Meeting and Palliative Care Symposium. We've got an incredible line-up of presenters and panelists with more choices for timely, practical, interactive sessions to meet your educational and networking needs in a beautiful setting. New topics include prognostication in the age of immunotherapy, understanding requests for medical aid in dying, issues in disparate populations, transgender patients and cancer care, ethical considerations and more! Don't delay, register today at www.nnnecos.org/2018-annual. 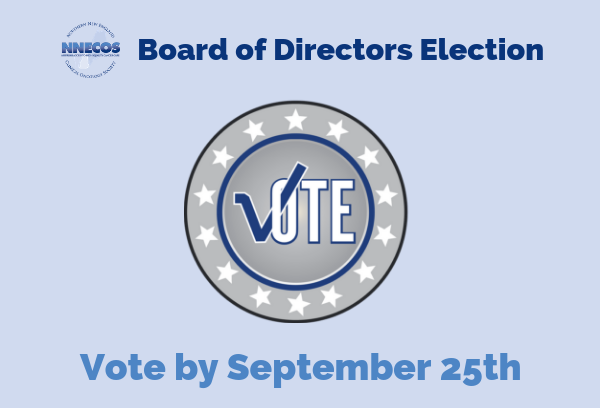 All Active Physician and Active Associate members in good standing are reminded to vote in the 2018 NNECOS Board of Directors election! Voting ends Tuesday, September 25th! Check your inbox for your official ballot from noreply@electionrunner.com or email info@nnecos.org for more information! Student-Led Grants Awarded & Available! 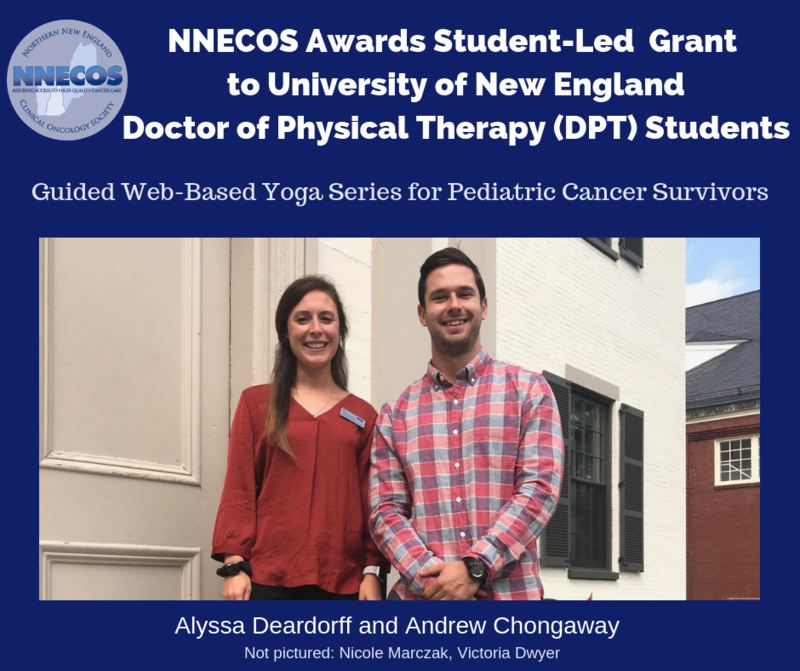 NNECOS is pleased to announce the awarding of a Student-Led Grant to a team of University of New England DPT students for their project, A Guided Web-Based Yoga Series for Pediatric Cancer Survivors. Additional grant funding is still available to student-led projects of value to the entire Northern New England community of cancer care providers and cancer survivors. Project grants will be awarded to worthy proposals, up to a total of $2,500. Applications are reviewed on a rolling basis.Learn more or apply at www.nnecos.org/student-research. NNECOS will award a limited number of educational grants (typical range between $2,000 and $4,000) in sponsorship of local educational activities. NNECOS will accept requests for applications (RFAs) from NNECOS members to support an educational endeavor (clinician‐focus or patient‐focused) at their practice or institution. These meetings will not be CME‐sponsored. NNECOS will review applications on a rolling basis until available funding has been awarded. 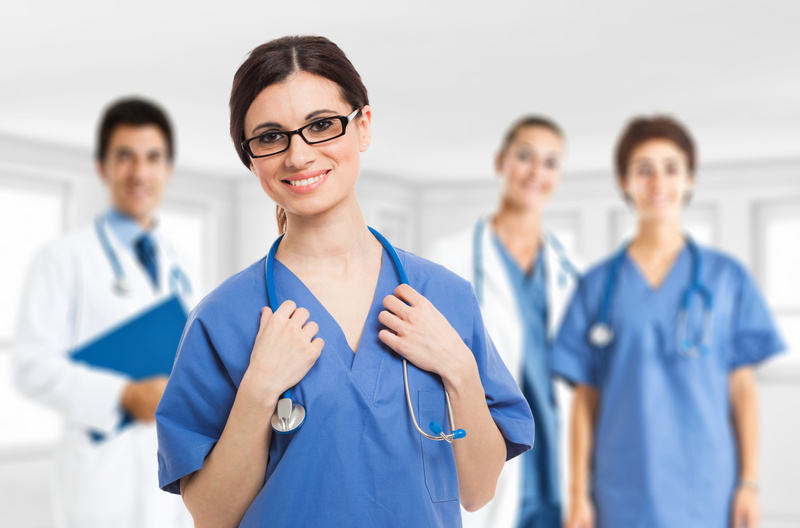 Recently approved projects include an OCN Review Course October 27th at Dartmouth-Hitchcock and a Medical Marijuana and Cannabidiol Education Program in Vermont. Please see our list of available presenters/topics. Learn more or apply at www.nnecos.org/educational-grants. Collaborative Research Grant Deadline December 15th! The deadline for the NNECOS Collaborative Research Grant is Saturday, December 15th! Up to $20,000 available per grant cycle! Eligible candidates will be a current NNECOS member in good standing. Projects should be in alignment with the society’s mission to assure access to high quality oncology care in our region. Preference will be given to projects promoting collaboration among NNECOS institutions (academic and community). Fellows and others are strongly encouraged to apply. Learn more at www.nnecos.org/research. Lunchtime Webinars Return - Register Today! 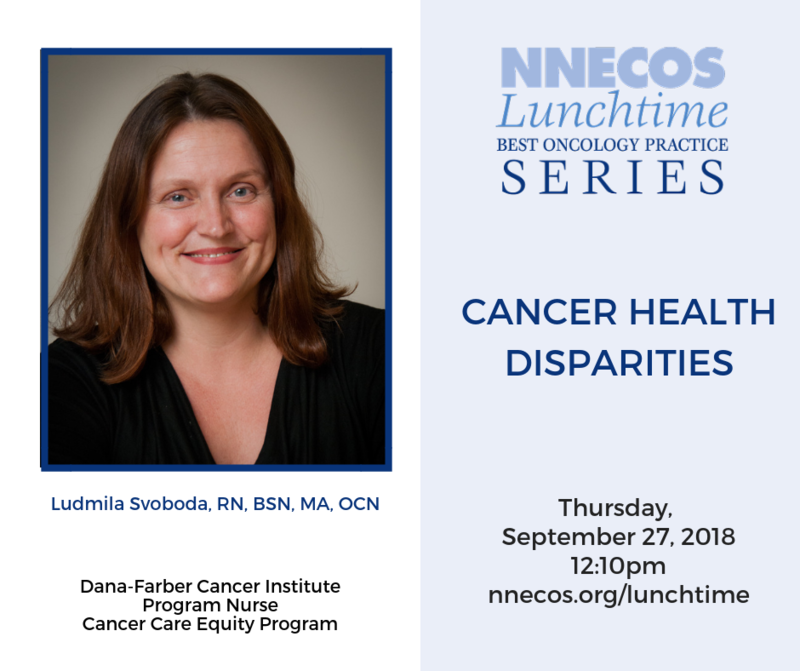 Ludmila Svoboda will present an informative lunchtime webinar on Cancer Health Dispartiies on Thursday, September 27th at 12:10pm. Pre-registration required! 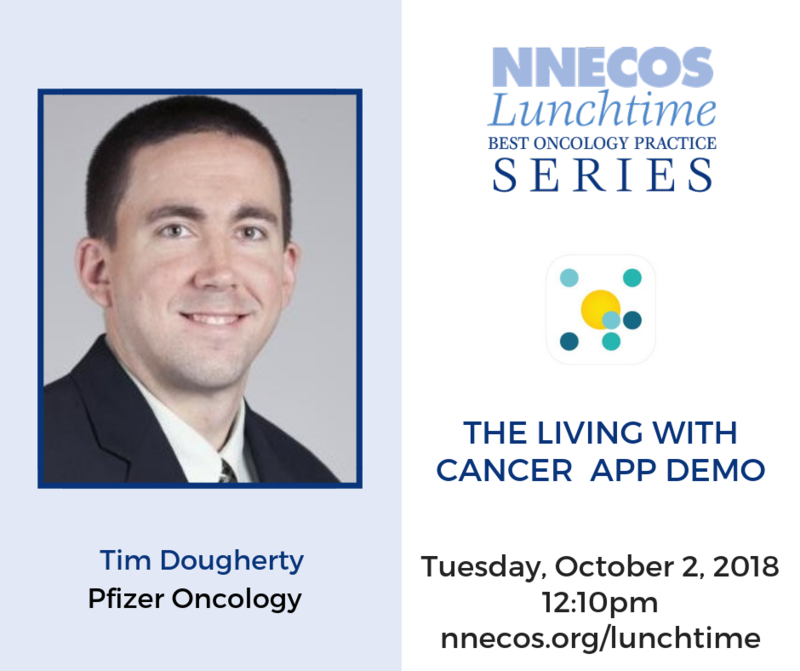 Join us Tuesday, October 2nd at 12:10pm for The Living with Cancer App Demo! Sign up today at www.nnecos.org/lunchtime. Last week, NNECOS and ASCO submitted a letter on the proposed MaineCare section 1115 Medicaid waiver. The comments detail NNECOS and ASCO’s concern that work requirement eligibility may hinder patients’ access to essential cancer care and reduce the already limited time physicians are able to spend with their patients. 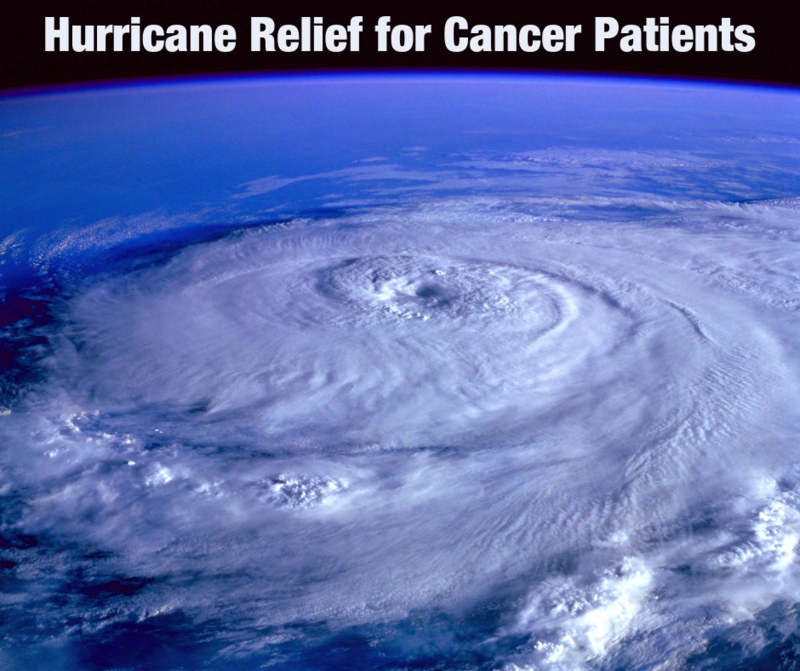 Our societies urge the Maine Department of Health and Human Services to exempt cancer patients from this requirement. In the latest ASCO in Action Podcast, Manali Patel, MD, MPH, joins ASCO CEO Dr. Clifford A. Hudis to discuss ASCO’s statement on Medicaid work requirements which, if approved, would make Medicaid eligibility dependent on a beneficiary’s work status. Dr. Patel shares her concerns with the proposed Medicaid waivers and stresses that many patients with cancer have no choice but to stop working entirely during their treatment. Listen to the full discussion, or subscribe through iTunes and Google Play.